On the 13th of December 2018, during the last plenary session of the year, the European Parliament held a debate based on the oral question (OQ) on rare diseases addressed to the European Commission, was initiated by EU-IPFF. EU-IPFF started its policy commitment in 2014 with the development of the first European IPF Patient Charter, and has since then encouraged the adoption of a Written Declaration on IPF by the European Parliament in 2016, and published its first EU-IPFF Benchmarking Report on Access to IPF care in Europe in November 2018. The development of the oral question and the success of having it included in the European Parliament’s plenary agenda represents a great milestone for the Federation and for patients with a rare disease, as it shows the commitment of the European institutions to take action in this field. We are very proud to have led this process together with some members of the European Parliament, namely John Procter (ECR, UK), Estefanía Torres Martínez (GUE/NGL, ES), and Tilly Metz (Greens/EFA, LU), as well as patients and healthcare providers. Together we managed to move the oral question forward and have it included in the plenary agenda. We are also very thankful to MEP Elena Gentile (S&D, IT) who has always supported the work of the Federation in order to promote better EU coordination for rare diseases and IPF. The plenary discussion was hosted by the European Parliament in Strasbourg and was opened by one of the OQ rapporteurs Gesine Meissner (ALDE, DE), who presented the oral question to the Vytenis Andriukaitis, Commissioner for Health & Food Safety. She shared a heart-warming personal story of how her family was affected by a rare disease. She pointed out that there are between 6.000-8.000 rare diseases in Europe and they affect about 30 million people, which is a considerably large number. As Ms. Meissner notes: “Essentially, a rare disease means that when people get the diagnosis, there are a lot of question marks.” We at EU-IPFF are aware of the emotional state post diagnosis, and work at a national and European level to ensure that we can provide patients with information and a support network. What measures has the Commission taken so far to ensure accurate and timely diagnosis of rare diseases, as well as access to affordable medicines required to treat them, across the EU? How does the Commission promote research in the field of rare diseases and into the development of new or improved methods for early diagnosis? How does it intend to further these efforts and achieve measurable improved outcomes for rare disease patients in all EU Member States? How does the Commission intend to guarantee access to information and to medicines and medical treatment for rare disease patients throughout the EU? How does the Commission promote better coordination and learning across Member States, given that access to early and accurate diagnosis can have a significant impact on the patient's prognosis and quality of life? What are the Commission's plans to ensure sustainable funding of patient organisations supporting the European Reference Networks on rare diseases, for example by means of the European Joint Programme on Rare Diseases? Commissioner Andriukaitis stated that, “In the past 20 years the Commission had been working on rare diseases, creating networks and encouraging innovative ways of working and research.” Rare diseases remain a priority for the European Commission and the work that has been done so far reflect this commitment. For example, the Commission supported the establishment of the European Reference Networks (ERNs), which are designed to facilitate access to timely diagnosis, linking experts throughout Europe. The EU-IPFF is for instance cooperating with ERN-LUNG (European Reference Network on Rare Pulmonary Diseases) in order to ensure that the patient voice is heard throughout the various ERN activities. Commissioner Andriukaitis concluded the plenary session by stating “no single country has the knowledge or capacity to tackle these diseases on their own. Together, we can share best practice, coordinate research, pool data and act more effectively and decisively.” EU-IPFF is in full agreement and hopes to further accelerate positive change throughout 2019 and beyond. We hope that by driving this process we have managed to launch a message to future European leaders to continue the conversation on how to improve the lives of patients living with rare diseases. We really believe that now is the time for European institutions to lead that conversation and involve all relevant parties, including patient organisations, in the identification of solutions to improve quality of life for rare disease patients across Europe. We are committed to continue working with all the relevant stakeholders to ensure that action on rare diseases remains a priority area at European and national level. We are glad to announce that Elena Gentile (S&D, IT), Member of the European Parliament, has been awarded with the EURORDIS policy maker award this year for supporting the cause of patients living with rare diseases and Idiopathic Pulmonary Fibrosis (IPF). In 2014, she gave voice to Idiopathic Pulmonary Fibrosis (IPF) Patient Groups by supporting the first European IPF Patient Charter in the European Parliament. Two years later, she authored and mobilised Members of the European Parliament around a Written Declaration on IPF in 2016, which successfully passed with majority of the Members of the European Parliament (388 Members). The Written Declaration urged the Commission and the Council to promote research into IPF to help find its cause and cure; to collaborate with Member States as to enable access to EMA approved orphan drugs for IPF patients; and to ensure equal access to non-pharmacological treatments, including lung transplants, for patients across the Union. Thanks to her support, the Italian IPF Member Organisation (AMA Fuori Dal Buio) managed to organise a hearing in the Italian Senate, which triggered the inclusion of IPF into the National Health Basket in 2016, allowing all Italian IPF patients to access treatment across the country. In 2017 she has endorsed EU-IPFF’s awareness campaign “Listen for the Sounds of IPF” and hosted a Parliamentary roundtable to bring to the attention of European policy stakeholders the recommended actions to improve early diagnosis of rare diseases and better connect primary care providers and recognised centres of excellence across Europe. Being a trained doctor herself, she understands how difficult it can be to correctly diagnose and manage complex conditions – especially rare diseases – and recognises the need for political support to ensure that resources and expertise are pooled to ensure that the best care is provided and made accessible to all patients regardless of their origin and income. To show her commitment and dedication to the improvement of rare disease policy, she is also supporting the Parliamentary advocates for rare diseases, which was officially launched in October 2017. MEP Gentile has given voice to the IPF community and has broken the silence that has isolated for years patients with this chronic, progressive, irreversible and fatal disease. Her dedication and commitment to put IPF on the European Agenda has and continues to give hope to IPF patients and their families, who are fighting to find the cause of the disease and a cure. More information on the EURORDIS Black Pearl Award is available here. In addition, during the Roundtable Discussion, Dr. Francesco Bonella delivered a presentation on the unmet needs and the ensuing call to action for patients and HCPs. Dr. Bonella first stressed the many challenges HCPs face in caring for IPF patients, from diagnosis to the complex management of IPF, and the research gaps. Again, EU-IPFF would like to thank MEP Gentile for concluding a successful session as well as thanking all speakers. 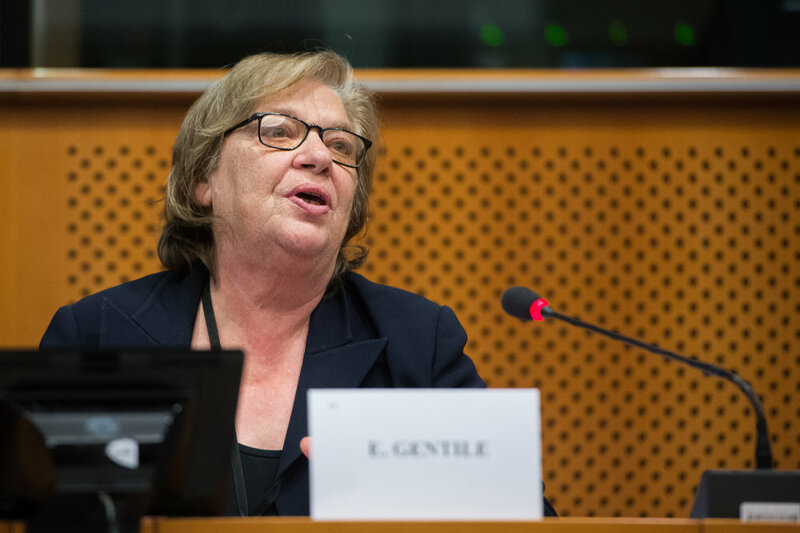 MEP Gentile concluded the meeting by pledging to write a letter to future Presidencies of the European Council to discuss the implementation of the recommendations of the Written Declaration – we look forward to hearing back from her. In April 2016, a Written Declaration on IPF was launched with the support of 16 Members of the European Parliament (MEPs). The Declaration aims to promote better cooperation between EU Member States to address existing health inequalities and promote research activities to find its cause and a cure. It encourages the European Commission and EU Member States to work together to support timely access to treatment, to limit the delays in approval by national regulators of authorised medication, and to address the existing inequalities in access to lung transplantation. You can find the full text of the Written Declaration here. Throughout a three-months campaign – including face-to-face meetings with MEPs and their staff, social media activities and a campaign stand in Strasbourg during parliamentary plenary weeks – the Written Declaration was signed by 384 MEPs and consequently officially adopted by the European Parliament in September 2016 (*to be adopted, a Written Declaration needs to gather the signatures of at least 376 MEPs). Following its adoption, the Declaration was forwarded to the European Commission and the European Council for a response to its requests. “We have worked hard on the Written Declaration and thank MEP Elena Gentile, who spearheaded the declaration with us. We are very grateful to all MEPs who signed the Written Declaration on IPF and listened to our personal testimonials. We hope to get positive feedback from the European Commission and European Council in order to provide hope for the diagnosed and newly diagnosed IPF patients in Europe” said Carlos Lines Millán, President of EU-IPFF.